By GreenEyedLillies on January 2nd, 2009 . Filed under: Tattoos . Maria’s tattoo was done by Johan Avila with Apocalipsis Tattoo in Venezuela. Thank you Maria for sharing your cupcake tattoo with us. It’s beautiful! Very cool sugar skull and I love how you incorporated cupcakes! 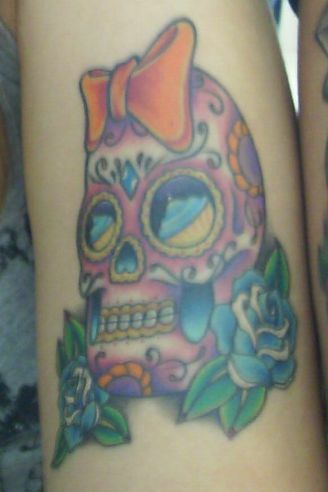 this tatoo is actually a great peice of art.mine is identicle to this one..